Climate Action Moreland is campaigning on climate related election issues in the Moreland based seats of Brunswick, Pascoe Vale and Broadmeadows and also in the Northern Metro Region (Legislative Council). The State election is on Saturday 24 November 2018. We have done a policy review of all party groups standing for the Northern Metro Region (Legislative Council). These are the confirmed candidates groupings in ballot order according to the Victorian Electoral Commission, followed by our comment on their climate policy statements or general policy. 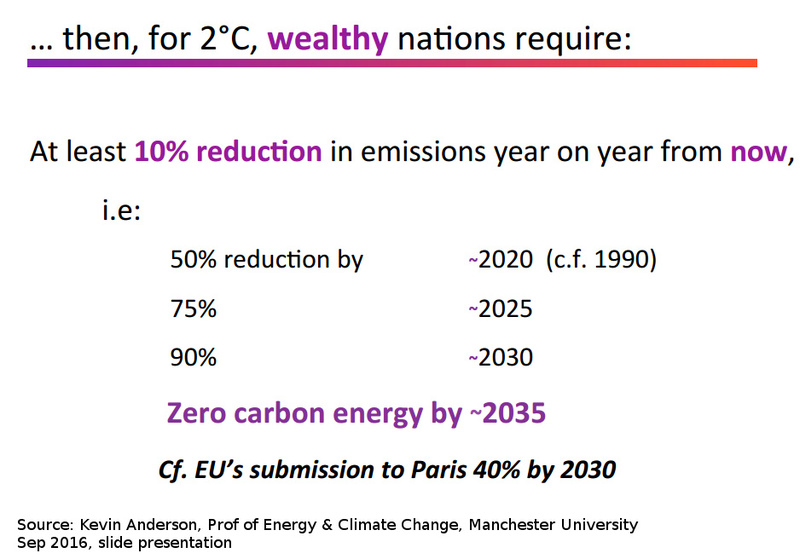 Comment: Has a very general Environment policy, but no explicit climate policy. No energy policy. Wants to stop wasting of taxpayers money. Policies lack detail. Comment: Fiona Patten has a general environment and climate policy and her parliamentary record has been one of supporting the Labor Government proposals on climate and renewables, and advocating for more walking and cycling infrastructure and more efficient public transport, and increase outer suburban liveability. She has been an active and engaged MLC who responds to constituents. Update: 12 Nov: Liberals release energy policy with a commitment to build a new ‘baseload’ 500 MW power station if elected. Friends of the Earth released a statement in response saying the Liberal party’s decision to release an energy policy open to new gas and coal power fails the climate change test. While we didn’t survey Upper House MPs, you can read the climate survey responses by Tim Read (Brunswick) and Phil Jackson (Pascoe Vale). 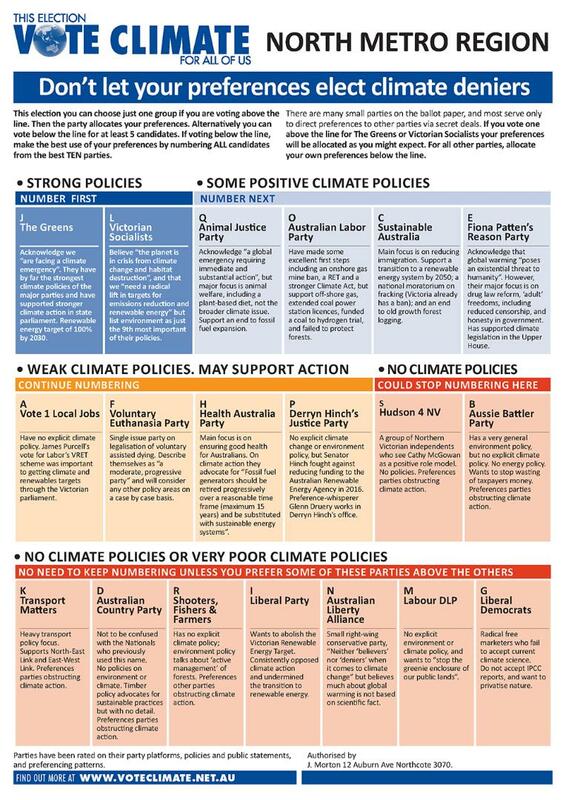 While we didn’t survey Upper House MPs, you can read the climate survey response by Stephen Jolly, Sue Bolton and Colleen Bolger. Comment: Does not have an explicit climate change or environment policy, although Senator Hinch fought against the Federal Government reducing funding to the Australian Renewable Energy Agency (ARENA) in 2016. Comment: focus is on animal welfare, but also recognises that urgent action needs to be taken to address global climate destabilisation. Changing diet an important focus. Strong animal welfare and environment policies. Key objectives in the Party on climate policy include: To rapidly transform to a carbon free energy infrastructure; rapidly transform Australian agriculture to allow reforestation by reducing grazing; prohibit any fossil fuel expansion; Implement a carbon tax on both the coal and animal agriculture industries; Direct carbon taxes into clean energy solutions, sustainable plant-based food agriculture systems and education; Protect existing forests and marine habitats from further destruction. Climate Policy. While we didn’t survey Upper House MPs, you can read the climate survey response by Animal Justice Party candidate Chris MILES (Brunswick). We sent out a climate survey to all Brunswick, Pascoe Vale and Broadmeadows candidates. 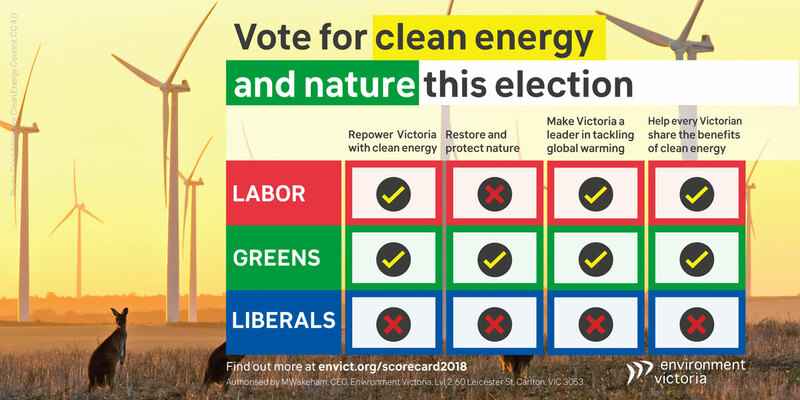 Read Environment Victoria’s Election 2018: Where the parties stand, scorecard. Preservation of old growth forests is essential for the carbon sink and carbon sequestration it provides, as well as numerous other environmental services, including providing habitat for threatened species and maintaining biodiversity when the earth is facing a mass species extinction event due primarily to human land use change and encroachment on natural environment and ecoysystems. 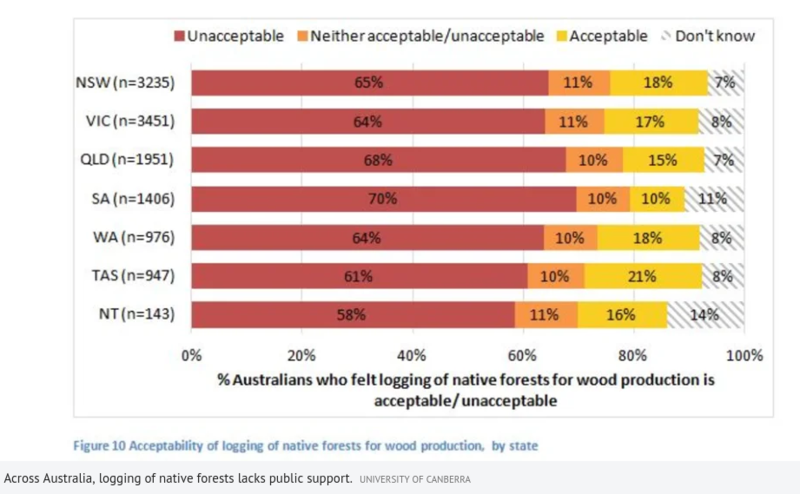 Most Australians want native forest logging ended. Friends of the Earth Vote Forests have rated the Labor Party, the Greens and the Liberal National Parties on the forests issue. Read their scorecard. Entry filed under: election, news, Politician education, Vote Climate. Tags: Northern Metro Region, vicvotes, vicvotes2018.